Fisheries researchers are excited by the first confirmed sighting this year of an endangered basking shark — Canada's largest fish that we once tried to wipe out. It's the kind of call from work you can actually be excited about early on a Sunday morning — if you're a research scientist with Fisheries and Oceans Canada, that is. 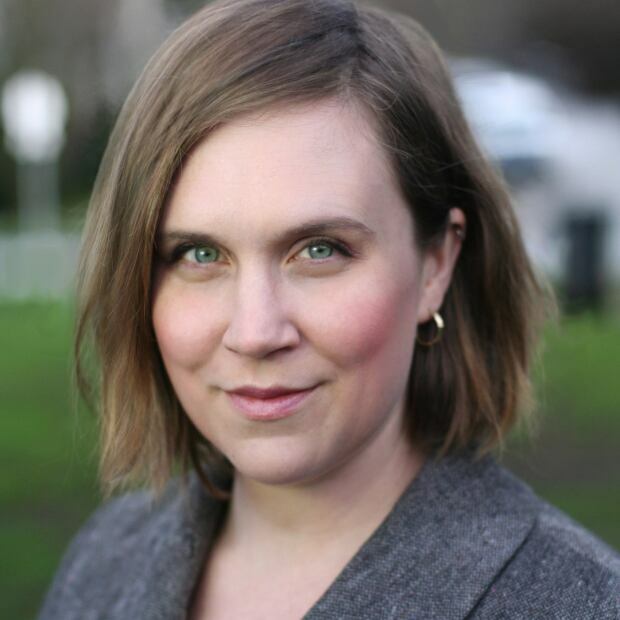 At 8 a.m. PT on May 29, Jackie King picked up the phone to the elated voices of her colleagues onboard the CCGS Vector, a science vessel patrolling B.C. 's Central Coast. "I can't believe they see a basking shark and I'm talking to them right now," said King, recalling her thoughts that morning. "It was a lot of excitement for sure." 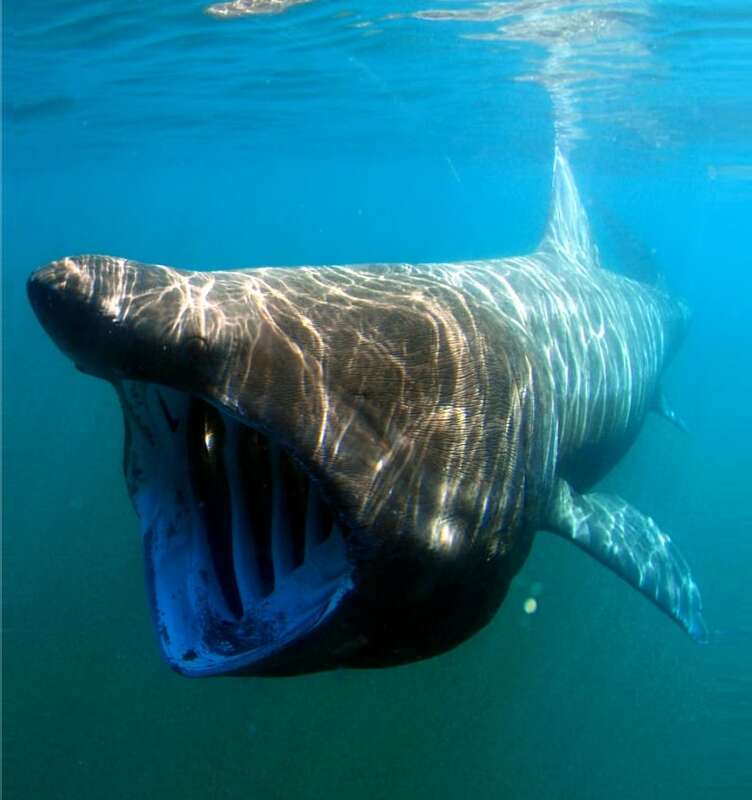 King herself has never seen a basking shark, but says she's dreamed of it. The endangered shark is the size of a bus, the largest fish in Canadian waters and used to hang out in groups of 100 or more off the B.C. coast. But they're now so rare — thanks to a federal eradication program and commercial fishery decades ago — that the couple of sightings in Canada each year is cause for celebration for those who hope these gentle giants can come back. 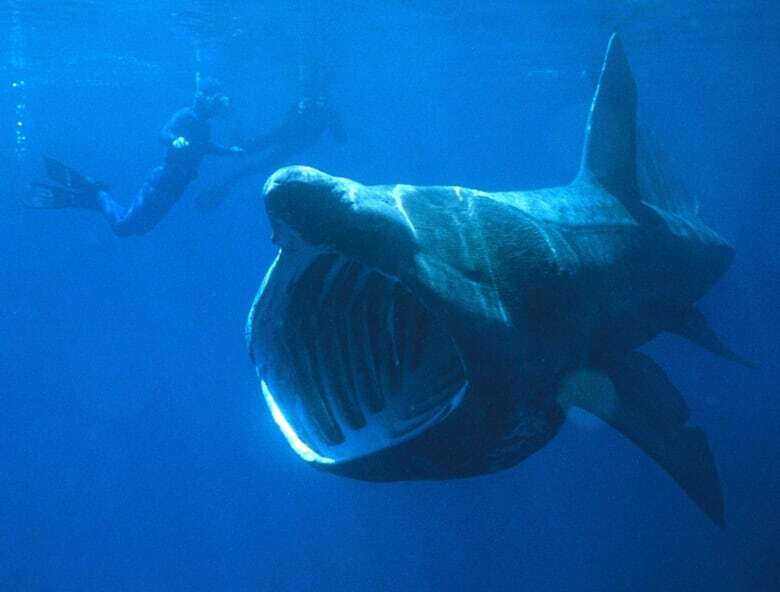 The Pacific population of basking sharks were listed as endangered in Canada in 2010, but "virtually disappeared" from B.C. waters years before that. "They were considered by commercial fishermen to be a bit of a nuisance because they would get entangled in nets," said King. 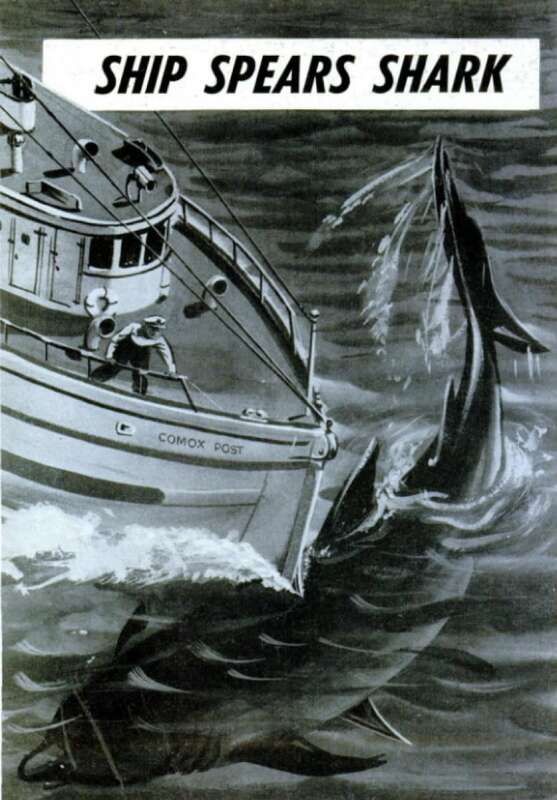 They were officially deemed "Destructive Pests" by the federal fisheries department in 1949, as Scott Wallace and Brian Gisborne document in the book Basking Sharks: The Slaughter of B.C. 's Gentle Giants. In 1955, the federal government began a 14-year eradication program, which included a specially-commissioned vessel equipped with a blade on the bow, to ram the sharks and slice them in two. "The sharks, floating lazily near the surface of the water, are no match for the skillfully handled vessel [with its] sharp point and keen upper cutting edge," wrote Popular Mechanics about the blade in 1956. The sharks were also commercially fished for liver oil and died in fishermen's nets. 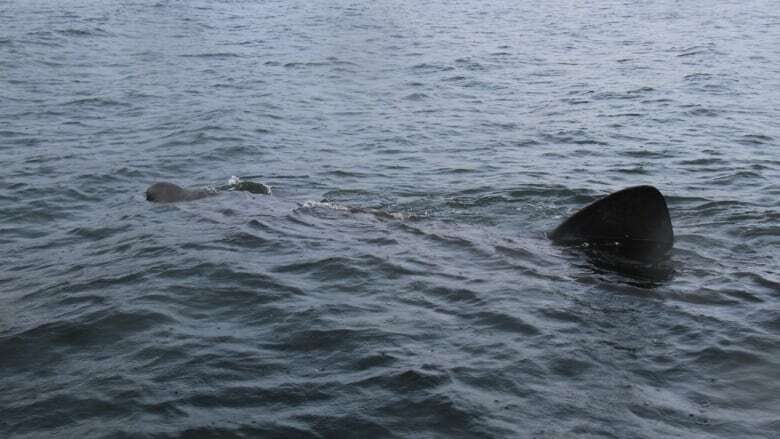 It was obvious to excited fisheries researchers last week they had spotted one of these sought-after basking sharks, but it might be trickier for the untrained eye. "They will most likely be this large animal that you can't quite tell, is that actually a shark?" said King. The first clue is their size. Basking sharks are "exceptionally large," said King. They're the second-largest fish in the world usually reaching nine metres long, with reports of some reaching 12 metres. They're generally spotted "basking" near the surface, cruising for the tiny zooplankton that makes up their main food source, with a dorsal (back) fin that may reach one metre out of the water. "It's going to have its mouth wide open filtering, [that] gives it this really weird look," said King. "People typically think of sharks as being voracious predators, but these are really gentle giants that feed by filtering out the water at the surface and eating tiny little plankton." Eight years ago, Fisheries and Oceans Canada established a shark hotline at 1-877-50-SHARK to gather information from fishermen and anyone else on the water who might spot a basking shark. There's also an online form to submit photos, something King says they receive surprisingly few of — given the ubiquity of smartphone cameras. So, if you see something big and "weird," with a large shark-like fin, King wants to know about it. 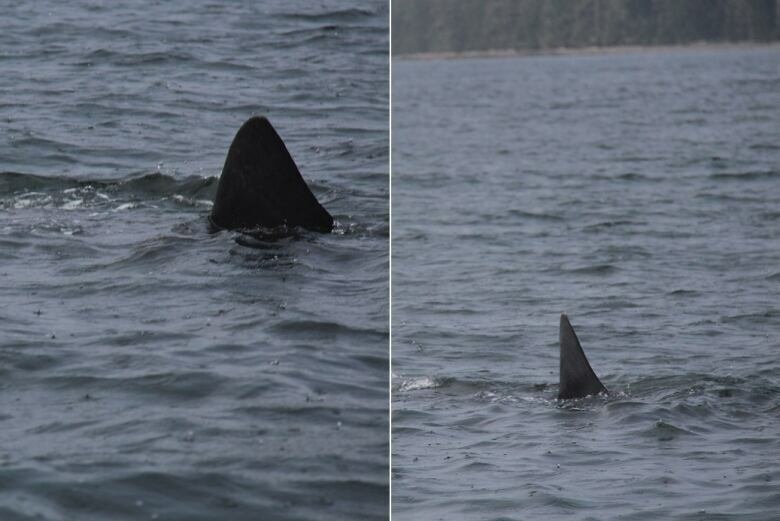 "It's pretty special to get to see a basking shark in our waters."